Perhaps give away or sell the rest? The www.KidsGardenClub.org theme garden for summer 2010 is an African-American Heritage Garden. It is hoped that kids' garden clubs all over the city of Omaha will be growing these same plants and learning and enjoying. Enrichment activities will be posted on this website all summer long for these plants, as well as others that clubs might want to grow, too. It's a fun way to combine gardening education with some multicultural history and also nutrition education. 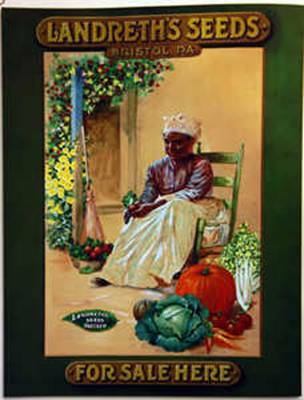 Best of all, there's good eating ahead, if you start an African-American Heritage Garden. Use the short articles in the "Planning" section of this website to prepare your garden bed and plan for watering and nourishing your garden. Measure how much space you have. You'll have to match your space with the needs of the plants you grow. You don't want to plant too much, but you sure want to plant enough! It's probably a good idea to limit your garden to about 100 square feet to start, and plan to grow about 10 plants to start. Once you master that, you can expand next year, if you want to. But you don't want to get in over your head! You can find seeds for most of these from your favorite garden store, or go online to any number of seed companies. Sadly, the Black people who first grew these seeds were coming to the United States to be slaves. They were coming from Africa and the Caribbean. Naturally, since they were literally being "transplanted," they brought along the seeds of their favorite food plants from their gardens in order to transplant them here, and grow the same plants once they got here so that they could eat the same foods. They also innovated with plants that were native to the American South, where they were slaves. They learned to grow these new food crops, developed recipes for them, and combined them with their own family favorites for some of the best American cooking of all. These food plants produce fruits and vegetables that are among the most nutritious and delicious of all food products. Chart the length and width of your garden onto grid paper with fairly large squares. It's a good idea to make one square represent one square foot - 12 inches square. Then, when you look on the seed packet to see how far apart to plant your plants and seeds, you will neither overcrowd nor plant too sparsely. Choose which plants you would like to grow, and how many plants of each type you would like to try, depending on how much garden space you have. Notice how many inches - or feet - apart you are supposed to plant the seeds of the different varieties. If you decide to have watermelon plants, you will need a lot more space than a few turnip greens. In fact, if you choose watermelons, you might not have room for many more plants, since they spread out so much, unless you can start another garden bed. So look on the package directions for how much space each plant needs, and plan accordingly. Draw boxes or ovals in your grid showing where they will spread out to, once they are full-grown and begin to bear. Now, order the seeds, and wait! For gardeners, that's the worst part! If you have the equipment to start the seeds indoors, do so several weeks before the last frost. Otherwise, plant the seeds at the time and in the way instructed on the seed package. Be sure to keep those seed packets for future reference! As the garden gets going, you can have fun interviewing people who are African-American and happen to be good gardeners and good cooks. They will no doubt have some great tips for caring for these plants, and might have some great traditional recipes to share with you, too. (3) sell the rest of your garden bounty in special baskets, with a few recipes, at your church or to friends, to raise money for next year's garden efforts.